Creating a one-page website is a relatively new trend. It is very effective if you only have a little content to add, if your website aims at fulfilling a specific marketing purpose (presentation of a product or service, subscription to a newsletter, registration for an event..) or if you want to create a showcase website. SiteW offers you easy-to-use tools, to build the different sections of your one-page website. SiteW offers you a feature that allows you to fix the menu of your one-page website. That way, the menu will always stay at the top of the page, while scrolling. With the full width option, you will be able to easily define the different sections of your one-page website, whether it be by using an Image block, a Box block or even a separator. 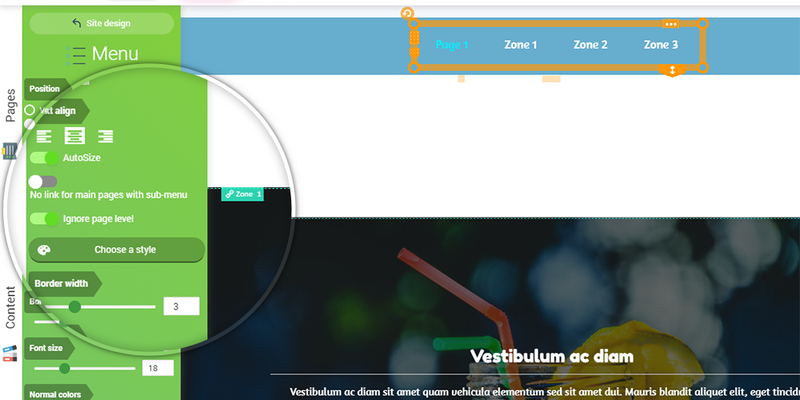 Enable the full width option by checking it in the Design tab, once you have selected your block. Right-click on the block and activate the feature “Fixed position” in the context menu. On the strip created, add a Menu block and fix it in the same way. Name your anchor (in the field “Internal link name”) and add it to the appropriate menus, by checking them in the context menu. Select the menu and click on the button “Manage pages” in the blue panel on the left of the screen. Drag and drop the anchors with the mouse to order them the way you want. Add an Image block with the Full width option on, and enable the Parallax feature in the settings in order to obtain a very trendy 3D effect! You now know how to easily build a one-page website that will allow you to fulfill your marketing purposes. Get to your keyboard!